★ High Quality: The folding hand truck constructed from superior aluminum alloy and plastic. It's strong and durable. The wheel is more wear-resistant and it could use long time. ★ Telescoping Handle: The telescoping handle could extend to 26.5 inch for convenient load handling. And the adjustable height suits various users and jobs. ★ Convenience: The hand truck is foldable, it can be folded up easily in few seconds, compact size and light weight, fully folded can be put into dwelt backpack, trunk of your car, saving you energy and time. 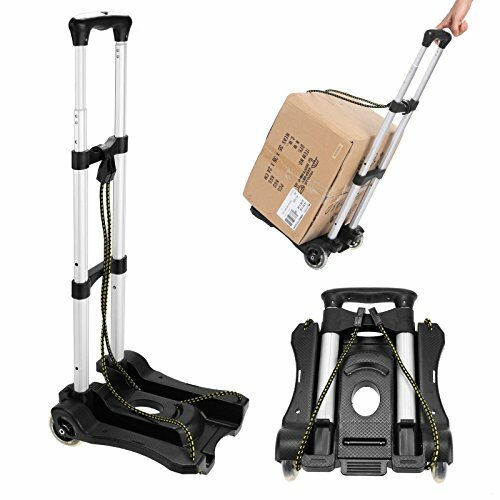 ★ Easy to Use: Come with elastic bungee cord, it is a very useful match with the hand truck. ★ Occasion: Perfect for use at home, office, business, travel or shopping. If you have any questions about this product by Creine, contact us by completing and submitting the form below. If you are looking for a specif part number, please include it with your message.